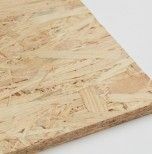 OSB 4 is an engineered wood-based panel, particularly suitable for use in the construction industry for structural or non-structural purposes. The OSB 4 panel is notable for its elasticity and resistance to bending, as well as being an economical option due to its versatility, and as a support for practically all kinds of roofs, including bitumen, brick and tile. In the packing industry, under wet or dry conditions, it allows for a high cost-benefit ratio due to its resistance and lightness and because it is available in large sizes. It also provides a wide range of decorative options, because of its natural wood fibre pattern and the ease of varnishing or application of other textures. It is a versatile option, which is economical as well as environmentally friendly, as the raw materials used are small, coming from rapid growth species of trees. 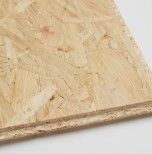 OSB 4 is a high performance panel that exceeds many of the EN300 requirements. It has excellent humidity, resistance and impact performance, making it the ideal choice for the most demanding of uses.